The National Institute of Standards and Technology is revising guidance aimed to help organizations sanitize data based on the confidentiality of stored information. 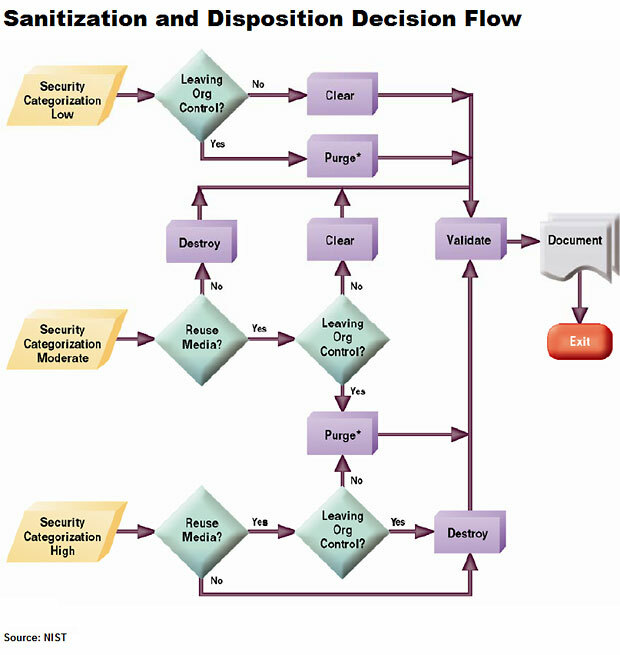 Draft NIST Special Publication 800-88 Revision 1: Guidelines for Media Sanitization discusses methods, techniques and best practices for the sanitization of data on different types of media, employing risk-based approaches to establish and maintain a media sanitization program. The revised guidance doesn't specifically address all known types of media, but it does describe a sanitization decision process that can be applied universally. NIST is seeking public comment on the draft guidance to consider before issuing a final report. Comments should be submitted to 800-88r1Comments@nist.gov by Nov. 30. Clear: Applies logical techniques to sanitize data in all user-addressable storage locations for protection against simple non-invasive data recovery techniques. It's typically applied through the standard read and write commands to the storage device, such as by rewriting with a new value or using a menu option to reset the device to the factory state, where rewriting is not supported. Purge: Prescribes physical or logical techniques that render target data recovery infeasible using state-of-the-art laboratory techniques. Destroy: Renders target data recovery infeasible using state-of-the-art laboratory techniques and results in the subsequent inability to use the media for storage of data. How to protect your Andriod-based Mobile? Real video footage of what skimmers "see"
How Critical Is To Keep Your System Upto Date?